According to DisplaySearchâ€™s latest mobile phone panel shipment and forecast report, the total revenue of mobile phone panels is expected to grow by 47% in 2011, and by 19% in 2012, the amount will reach US$22.4 billion; due to strong growth in the fourth quarter of 2010, In 2010, the total shipments of mobile phone panels reached 1.6 billion units, up 10.8% from the previous year. In 2010, the total shipment revenue reached 12.8 billion US dollars, and the annual growth rate was 10.4%. In addition, the average price of mobile phone panels remained at US$7.9 in 2010, maintaining the level of 2009, resulting in a significant increase in total revenue. DisplaySearch also pointed out that due to the growing demand in emerging markets and the tendency of users to use smart phones, the demand for mobile phone panels in the market is facing high standards, including requirements for panel size, resolution and technology. According to Xie Zhongli, senior analyst at DisplaySearch, â€œWith the continuous growth of emerging markets and the shift of smart phones, the mobile phone market will continue to grow; at the same time, it will increase the demand for high-end products, including the size, resolution and technology of mobile phone displays. Etc.â€ The agency estimates that mobile phone panel shipments in 2011 will reach 1.8 billion. The fastest growing category of mobile panel display technology is AMOLED. It is estimated that the market will grow by 191% to 128 million in 2011, and 66% in 2012 to reach 212 million; AMOLED phones Panel shipments for 2011 and 2012 are estimated to reach US$4 billion and US$6.4 billion, respectively. The DisplaySearch report also showed that in 2010, a-si TFT LCD led all mobile phone panel display technologies with a market share of 61.5%, while low-temperature polysilicon (LTPS) TFT LCD was more competitive in the smart phone application market in 2010. The mobile phone application market reached 316 million units, accounting for 19.5% of the total. In spite of this, compared to 2009 shipments of 29.98 million units, the growth rate of LTPS panels is still not as good as the a-si panel, which is mainly limited by capacity. DisplaySearch predicts that the LTPS panel will be developed towards the larger smartphone market and the production capacity is expected to increase gradually. High-end camera display resolution upgrade In order to compete with the iPhone 4, mobile phone manufacturers have begun to upgrade the resolution of high-end display models; DisplaySearch pointed out that before this, the most common resolution of the LTPS panel is qVGA (240 x 320) The market share was about 42.5%, but it quickly fell to 17.5% in Q4 2010. Instead, it was WVGA, which became the mainstream technology for smart phone displays since Q2 of 2010. 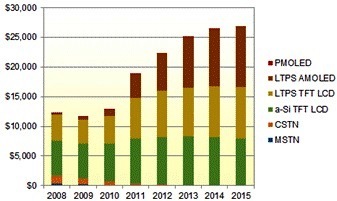 In the fourth quarter of 2010, shipments of WVGA (including LCDs and AMOLEDs) and 480Ã—800 panel shipments reached 29 million units, up 26.1% from the same period of 2009, and shipments of 480Ã—864 resolution panels were shipped. The volume also reached 11.8 million, an increase of 10.9% over the same period in 2009. Leading LTPS panel specifications in 2010 include WVGA (480Ã—800 market share 8.6%, 480Ã—864 12%), NHD (640Ã—360, 15.5% market share) used in Nokia touch smartphones , With DVGA used in the iPhone (640Ã—960, 11.6% of market share). Due to the popularity of the iPhone, DVGA shipments in the fourth quarter of 2010 accounted for 18.5% of the total LTPS panel shipments, with shipments reaching 15.1 million units. Shipments of hVGA (320x480) panels in the third quarter of 2010 fell 36% from the previous quarter, while shipments in the fourth quarter grew by 105.7%. DisplaySearch pointed out that the above data reflects that WVGA has become the mainstream of high-end smart phone display specifications; but the strong growth of hVGA panel in the fourth quarter of 2010 means that panel makers adopt low-cost specifications to maintain overall shipments in 2010.